We need to copy and paste data between several open windows. We need to exchange a lot of data between EDI and our internal system. After migrating to a new system, we need to transfer our data to a new database manually. Leave it to NTT-AT's Office Robot! Office Robot software creates and automatically executes scenarios to handle computer tasks people have traditionally done manually. Scenarios can be recorded and created automatically by performing and demonstrating tasks. Work through busy periods without allocating personnel. 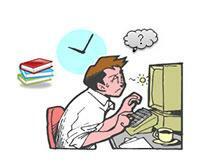 Automate routine manual work to get it done faster and more accurately, even in high volumes. Automation is easy to introduce. Automates operations involving multiple applications. Automates not just operations in popular Windows software (Microsoft Word, Excel, and PowerPoint), but online operations and operations involving internal systems. Learn more about Office Robot. Concerned about automating tasks that are detailed and require many complex steps? Not sure you can create scenarios? Need to train more personnel to create scenarios? Workshops are available to familiarize new users with Office Robot through hands-on training. Feel free to contact the Office Robot support center with questions or inquiries. Help on creating scenarios is also available from engineers who’ve supported scenario creation at NTT group companies nationwide. 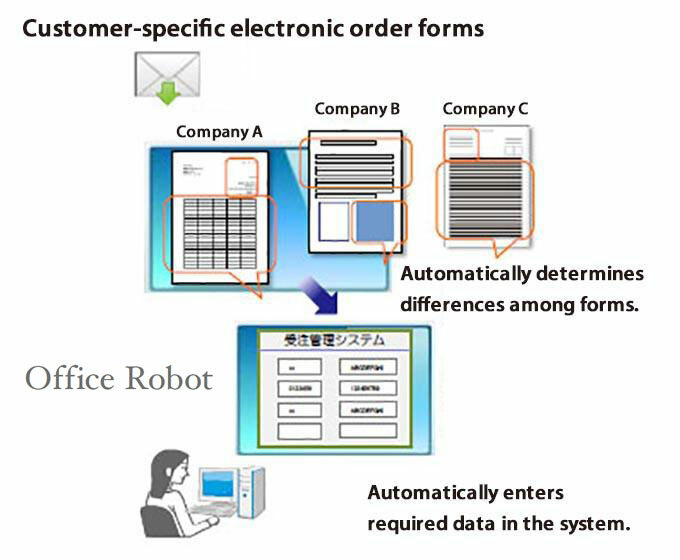 Office Robot automates input in an internal order-taking system from electronic order forms that vary from customer to customer. Based on order information from customers, internal order forms are automatically generated and emailed to manufacturers. Order data is managed by filtering the items to total and calculating totals by customer each month. This accounting is performed automatically in Office Robot with the click of a button. Office Robot can automate nearly any routine computer task. Useful where frequent, high-volume data exchange between EDI and internal systems occurs. Information is organized into the format used by suppliers, then sent to the suppliers. Personal information is removed from the information in an internal system. Only the required information is sent to suppliers. All of this work can be automated. When integrating new and existing systems, companies can also expect to copy data from their existing databases and paste it into the new systems. Large-scale manual data migration poses the risk of input errors. Office Robot eliminates data migration errors. Office Robot can automate data migration from an ERP system to Excel and between Excel and other systems. For example, it can be used to automate processes for setting up discounted product prices at stores and for restoring the original prices. See more examples of Office Robot applications.